Most outdoor shelters provide shelter from one thing - the sun. Coleman Shelters provide protection from the sun, the wind and the rain with our exclusive WindStrong™ System. This wind-tested technology combines vented canopies, shock-corded poles, patent-pending hubs and Guy lines to ensure your Coleman Shelter is strong, sturdy and secure. Next time you need outdoor shelter, count on Coleman quality to provide you with more than just shade. Check out Coleman Instant Shelters. 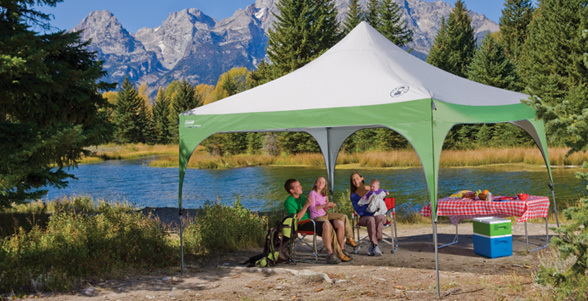 The patented Instant Canopy frame sets up in less than 60 seconds, leaving you more time for having fun. If you like to be outside and not spend a lot of time setting up your equipment, you’ll appreciate the Instant Canopies easy set-up.